Many Beatty residents were puzzled by loud booms they heard on a recent Saturday night. 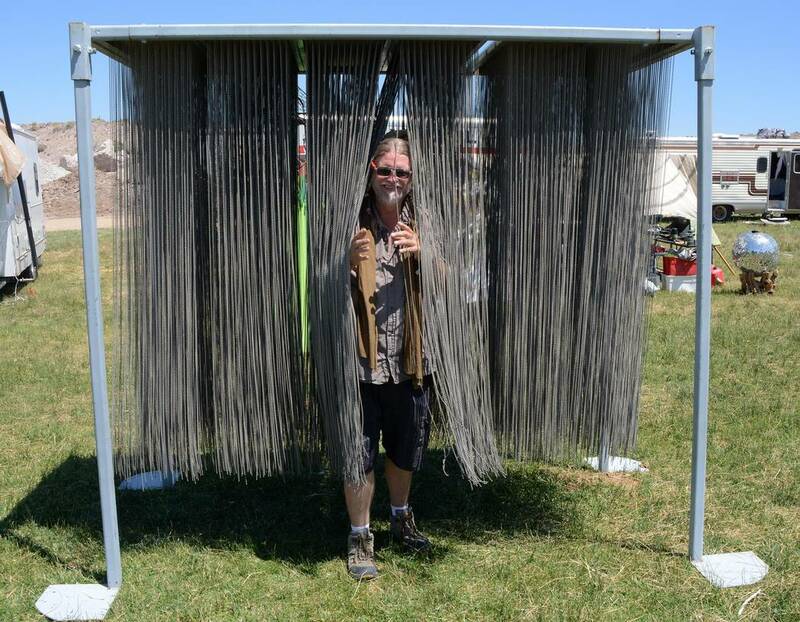 Richard Stephens/Special to the Pahrump Valley Times An attendee walks through Anthony Bondi's "Iron Curtain," a sculpture made up of more than a mile of strands of ball chain at the Southern Nevada Regional Gathering. 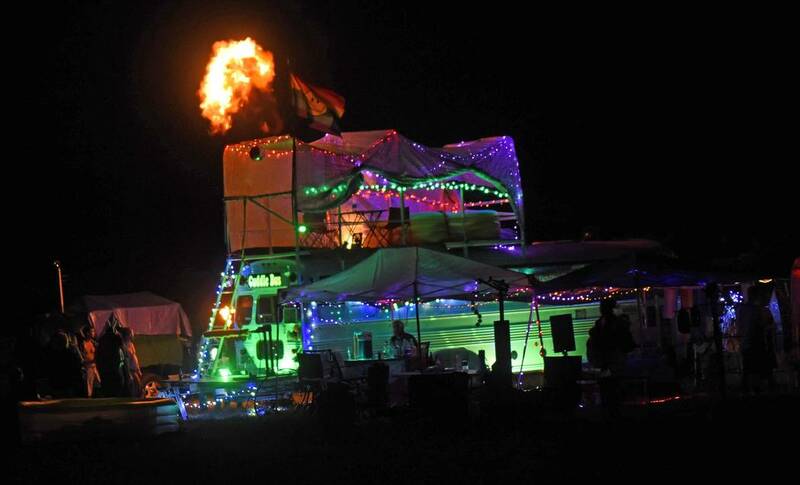 Richard Stephens/Special to the Pahrump Valley Times The Cuddle Bus with flame at the Southern Nevada Regional Gathering. 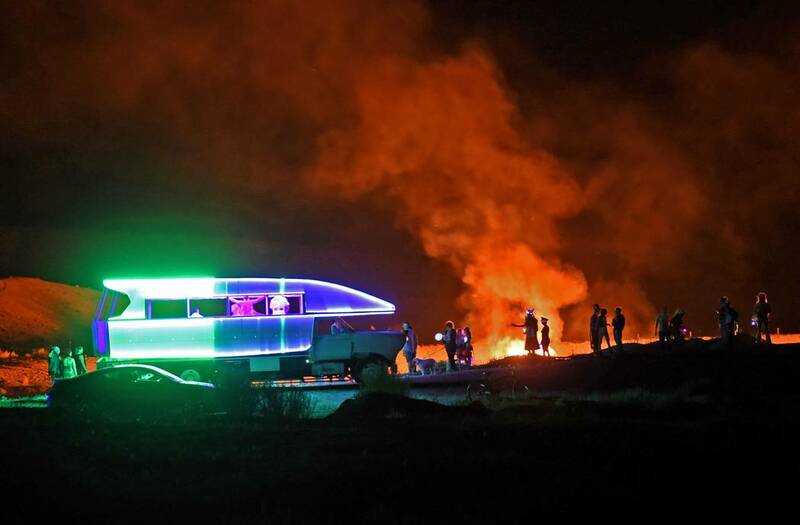 Richard Stephens/Special to the Pahrump Valley Times People dancing in and around the Dancetronoauts vehicle during the burn at at the Southern Nevada Regional Gathering. 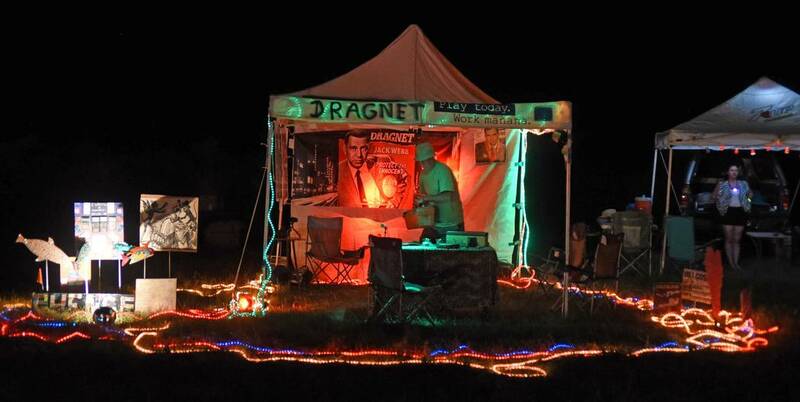 Richard Stephens/Special to the Pahrump Valley Times The Dragnet camp where you could be interrogated by Sergeant Joe Friday via sound clips from the show at the Southern Nevada Regional Gathering. Richard Stephens/Special to the Pahrump Valley Times A fire burst that was part of the pyrotechnics accompanying the burn. The heat and concussion were impressive at the Southern Nevada Regional Gathering. Richard Stephens/Special to the Pahrump Valley Times Fire Spinners performing before the burn at the Southern Nevada Regional Gathering. 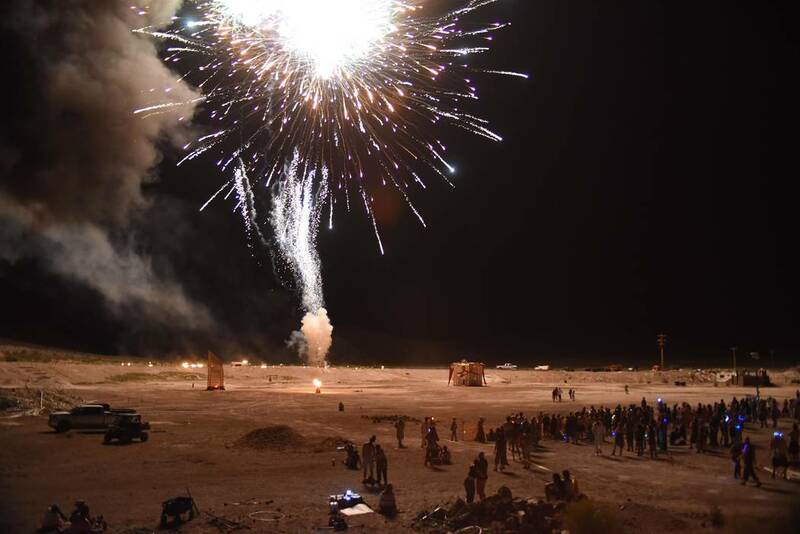 Richard Stephens/Special to the Pahrump Valley Times Part of the fireworks display before the burn at at the Southern Nevada Regional Gathering. 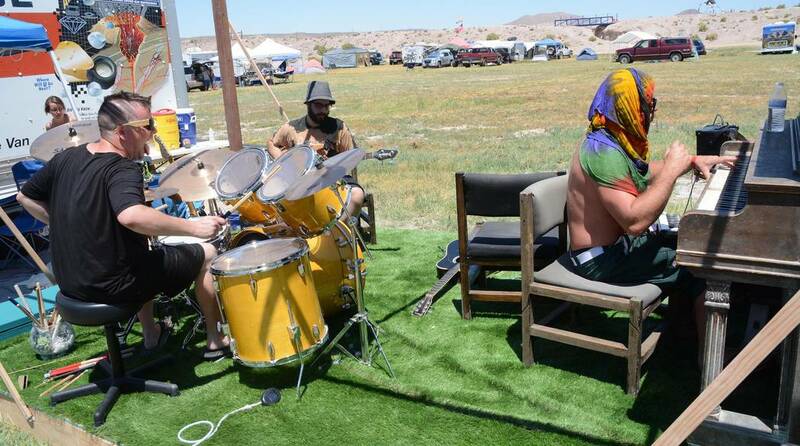 Richard Stephens/Special to the Pahrump Valley Times Guys Jamming at "Jam Camp," where everyone was invited to play on professional-quality instruments regardless of skill level at the Southern Nevada Regional Gathering. Richard Stephens/Special to the Pahrump Valley Times Syncro, the music sound stage at the Southern Nevada Regional Gathering. 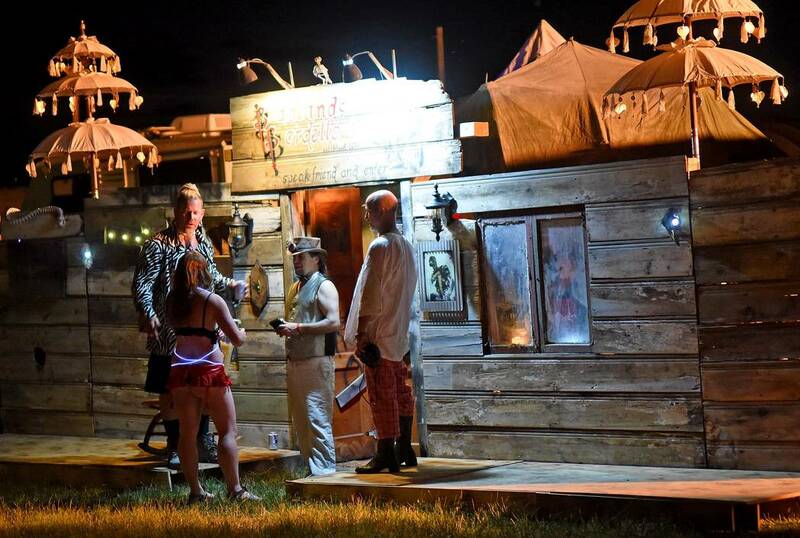 Richard Stephens/Special to the Pahrump Valley Times The Portal, one-sixth of the one used at Burning Man at at the Southern Nevada Regional Gathering..
Richard Stephens/Special to the Pahrump Valley Times A Steam Punk themed bar in the theme camp area at the Southern Nevada Regional Gathering..
Richard Stephens/Special to the Pahrump Valley Times The larger burn on the right is the "temple" at the Southern Nevada Regional Gathering. 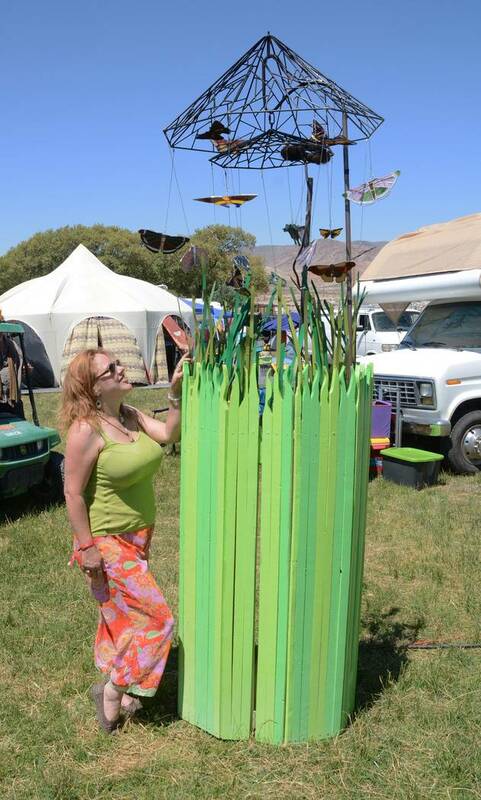 Richard Stephens/Special to the Pahrump Valley Times Lisa Stark with "Moths 2 the Flame." This piece is also a"poofer," meaning it poofs flame at the Southern Nevada Regional Gathering. Richard Stephens/Special to the Pahrump Valley Times Lisa Stark with "Moths 2 the Flame" poofing flame at the Southern Nevada Regional Gathering. 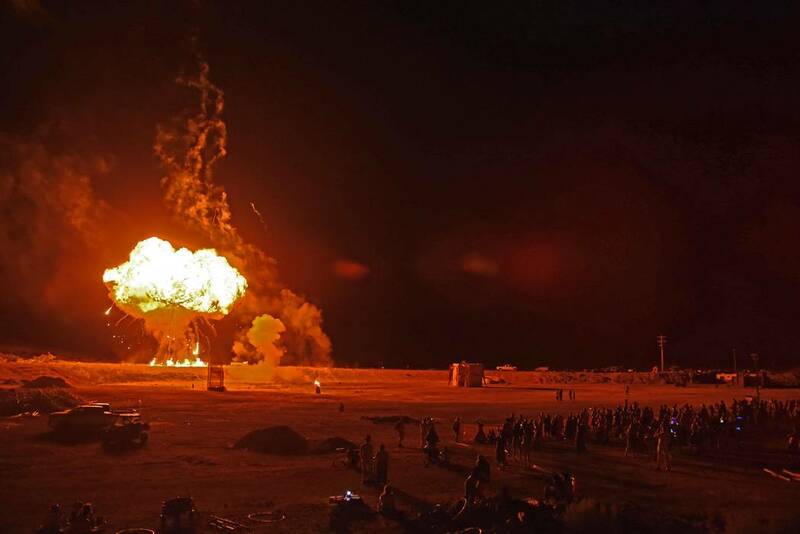 Richard Stephens/Special to the Pahrump Valley Times Orion Fredericks' "Gully" flaming with the lights of the theme camp in the background at the Southern Nevada Regional Gathering. 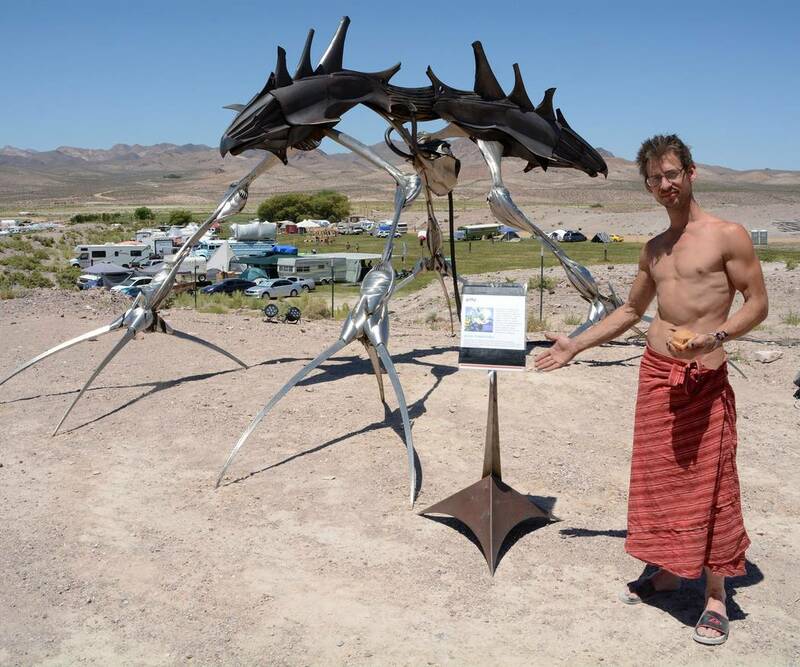 Richard Stephens/Special to the Pahrump Valley Times Artist Orion Fredericks with his sculpture "Gllly" at the Southern Nevada Regional Gathering. He calls himself an elemental artist. He said that "Gully" combines parts of his favorite animals--a mantis, a manta ray, a raven, and a shark. This sculpture emits fire. Richard Stephens/Special to the Pahrump Valley Times The "Red Neckery" camp at at the Southern Nevada Regional Gathering. 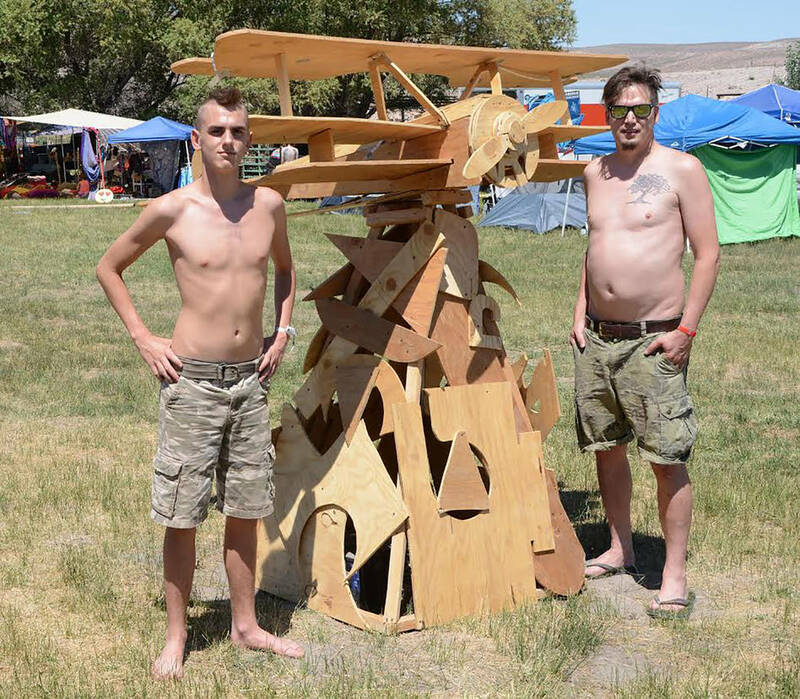 Richard Stephens/Special to the Pahrump Valley Times Isaac and Michael Wright from the "Post-Nuclear Family" camp with a sculpture of an airplane they made from scrap wood at the Southern Nevada Regional Gathering. It was one of the objects burned on Saturday night-- the smallest. 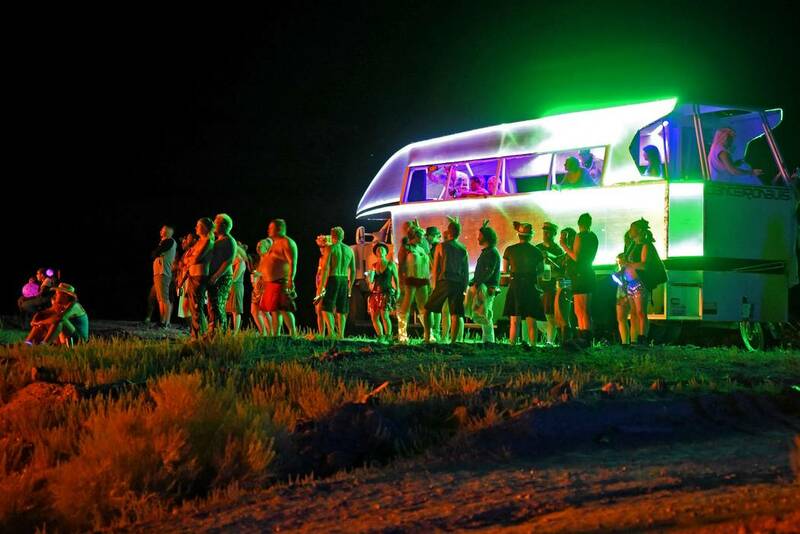 Richard Stephens/Special to the Pahrump Valley Times People dancing in and around the Dancetronoauts vehicle during the burn with this photo taken from the other side with the burn going on in the background at the Southern Nevada Regional Gathering. Most thought it was thunder, but could see no clouds or lightning. Others were curious about unusual vehicles seen passing through town. What they didn’t know is that Spicer Ranch, just north of town, was the venue for a regional Burning Man event called SNRG (Synergy), the Southern Nevada Regional Gathering. 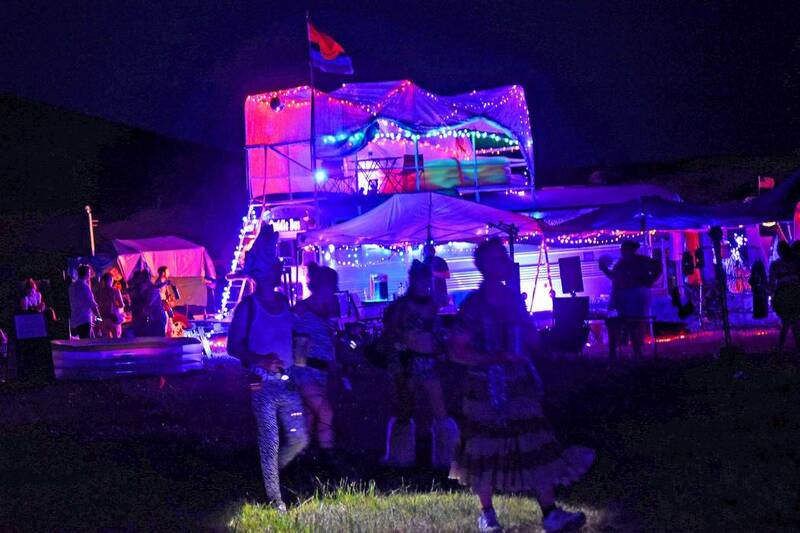 Like many other things at the gathering, both were much more impressive when they lit up colorfully at night June 24. 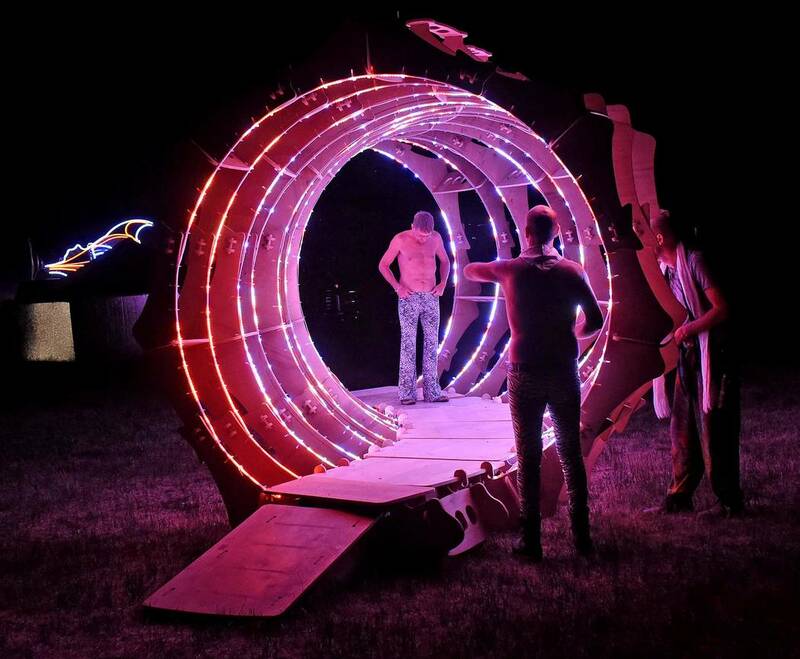 Regional events like the gathering are held all over the world as an extension of the Burning Man culture and experience. 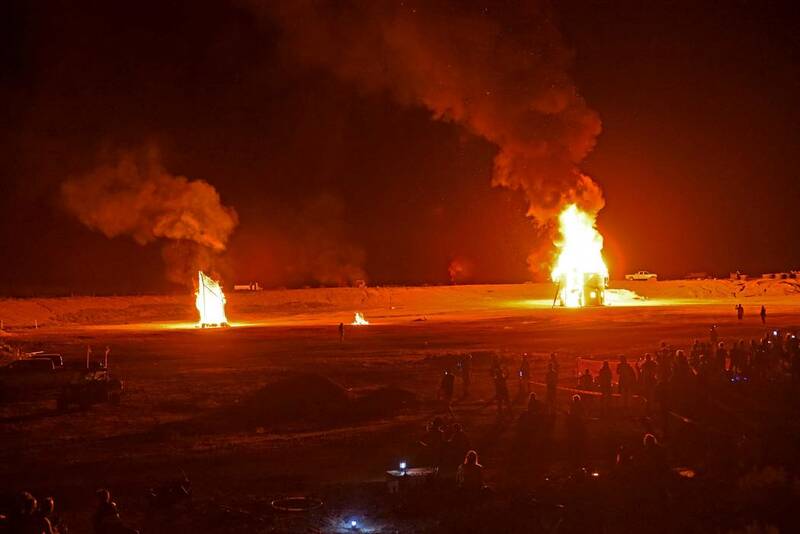 The gathering attracted about 500 Burners. 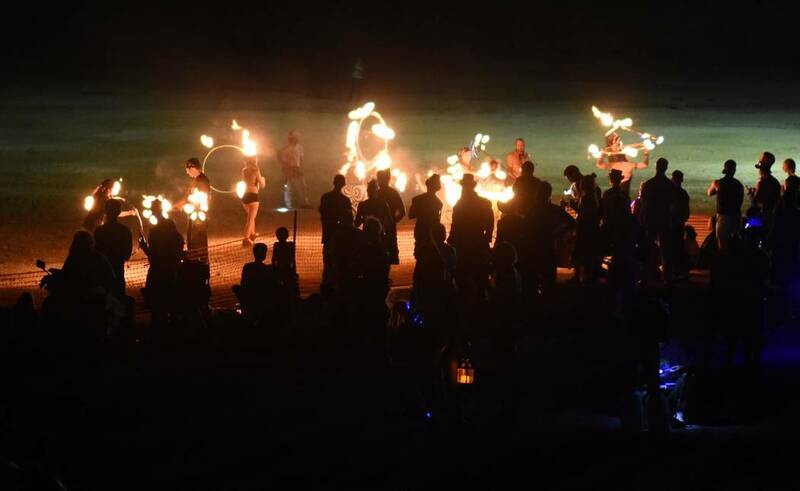 He said that the burner experience is more of a community and culture than just an event. Brad Hunt, who was supervising the event for ranch owner David Spicer, attested to the “clean up after yourself” behavior of the attendees. He said they carefully picked up everything, down to cigarette butts, and he was surprised to see a guy picking up cow pies in the meadow. Hunt noted that these were maybe the nicest, least troublesome folks they’d hosted at the ranch. Hunt was a popular guy with the Burners. 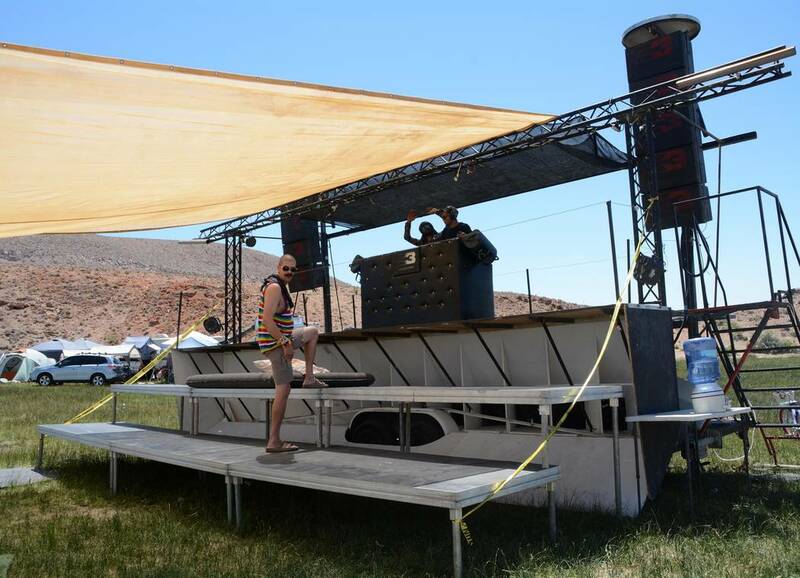 One fellow credited him with saving the event, which had the misfortune of being scheduled during a record-tying heat wave. Hunt was able to repair and set up some outdoor shower heads in the meadow so people could wet down and cool off. Smith has collected some 2,000 sound clips of interrogations from the old “Dragnet” TV show and has arranged them into a collection of 35 coherent interrogations. He invites people to his camp where they can be interrogated by Sergeant Joe Friday. Interesting artworks were scattered around the area, many of them created from repurposed materials, such as scrap wood or ball chain. 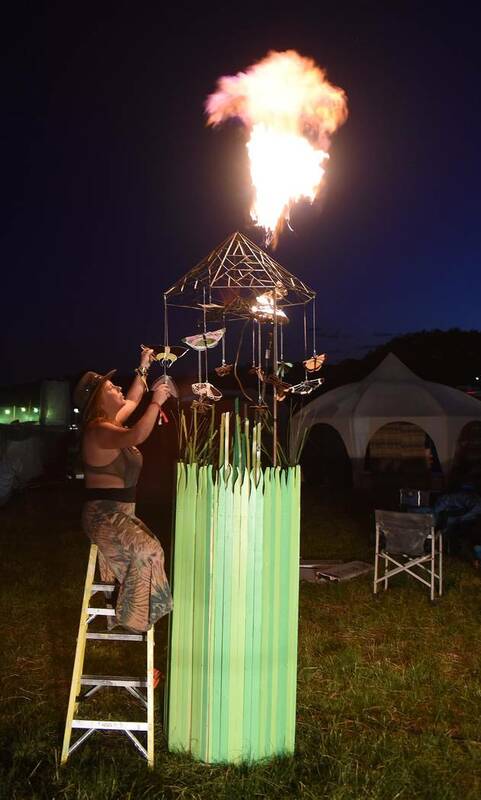 Perhaps the most popular art piece was “Gully,” by Vermont elemental artist Orion Fredericks. 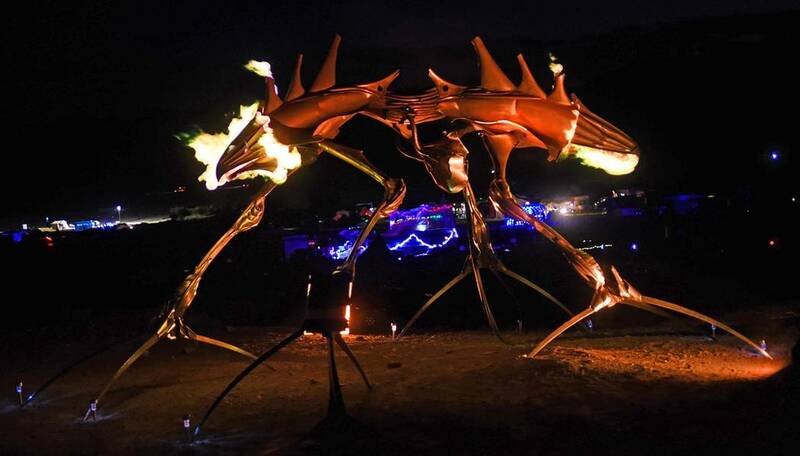 This dragon-like sculpture, made of stainless steel, drew crowds at night when it spouted flame from various parts of its body as the artist varied the effect from a control panel. The Burners universally said that they liked the Spicer Ranch location very much. They just thought that maybe the event should be scheduled away from the heat. One commodity very much in demand because of the heat was ice. Producer Rebollo said they were selling locally-supplied ice and that profits from those sales would be donated to the Beatty Volunteer Fire Department. Crystal Taylor, general manager of the Denny’s in Beatty, said that the restaurant was very busy serving the gathering’s attendees. Evidently, at least a couple of people from the event were so impressed with Beatty that they have been asking about the availability of property in town. Richard Stephens is a freelance writer living in Beatty.